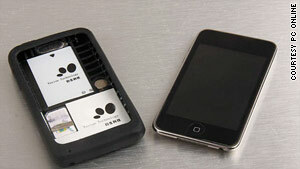 Turn your I-pod into an I-phone? An appealing product? The Apple Peel 520 is an example of China’s growing “shanzhai” products. (CNN) — Have you ever wished that your iPod Touch was an iPhone? Now it can be, thanks to a new device called the Apple Peel 520 and created by a Chinese company. Invented by a 22-year-old programmer who lives in the southern Chinese city of Shenzhen, the gadget is comprised of a case that fits around the outside of Apple’s iPod Touch, a popular media player and WiFi-enabled pocket computer with email, maps and other applications. The Apple Peel 520 case contains a battery, dock connector and SIM card that allows voice calls. Users will also have to install special software to enable a text messaging function, and to allow the device to properly work with the iPod Touch (users will have to break into the software of the iPod in order to download the necessary applications). Once installed, the Apple Peel gets around five hours of talk time and 120 hours on standby, according to a review posted on Dailytech.com. CNN had a conversation with the inventor of the device via QQ, a popular instant messaging service in China (he declined a phone interview and was only willing to offer his online name: “Maxpy”). Maxpy said he began building the device last April, revealing the final product online about a month ago via a company he started called Yosion Technology. The iPhone, which was officially launched on the mainland last October, more than two years after its debut in the US, costs between $588 – $740 while an iPod Touch is around $235. The Apple Peel sells for $57. Analysts said a thriving gray market flooded with fake iPhones smuggled in from Hong Kong and the West has hurt legitimate sales of the Apple smart phone here. The illegitimate phones are usually cheaper and contain functions, such as wireless Internet, that are not available on phones sold through legal channels. Whether or not the Apple Peel 520 will appeal to Chinese consumers or have any impact on iPhone sales in the country remains to be seen. So far, according to Maxpy, only around 150 of the devices have been pre-sold on Taobao.com, a popular Chinese e-commerce site. Two were sent to technology websites for review. While there are plans to mass manufacture the gadget in the future, Maxpy says those plans are on hold until the company can ensure there are no intellectual property right violations. Maxpy also said they want to check on Apple’s policy on “outside devices” as well as try to reach the company to see if they have any interest in the gadget, asking CNN whether we could put him in touch with Apple CEO Steve Jobs. We could not. Yet CNN did try to reach Apple representatives in Beijing and Hong Kong. No one was available for comment. There are also a few technical glitches to be worked out. According to a Chinese review translated into English on M.I.C. Gadget, the Apple Peel does not support 3G, there’s a small lag time when calls are made from the iPod Touch and deleting and forwarding text messages is not available among other minor complaints. Nevertheless, many say they are impressed with the functionality of the device. What’s more is the Apple Peel also illustrates the evolution of China’s massive “shanzhai”, or black market, phone industry. Based mostly in Shenzhen, it is an industry characterized by the massive production of copycat mobile phones and other devices, which are sold at lower prices and often with more localized functionality than global brands. Every year, millions of shanzhai phones are sold throughout China and exported to developing countries, resulting in a major dent in the sales of mainstream manufacturers in those markets, according to the research firm Gartner. “People are already or will soon be buying not just China-made but China-owned products,” said Benjamin Joffe, founder of the Beijing-based mobile and Internet consulting firm Plus8Star. “Most of Apple’s factories are in China, so it is not like China cannot make high-quality products,” he said. This entry was posted in Gadgets & Gizmo's, INTERNATIONAL and tagged Maxpy, QQ, Shenzhen China, Turn your I-pod into an I-phone?. Bookmark the permalink.